Tinned products, pates, soups, ready dishes, jars - Polish Food Products Ltd.
Top priorities in quality are included in company’s quality policy. Profi’s first concern is to meet customer’s requirements and expectation and simultaneously protect company’s interests. To maintain high quality of our product we improving existing products and introducing new, providing health safety, use only fresh meet and fresh vegetables, we do not use preservatives or chemical emulsifiers and we guarantee that Profi products are NON GMO (product not modified genetically). WE are the holder of many certificates: HACCAP quality system,IFS, BRC, ISO 9001:2000. 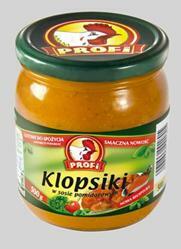 Profi as one of the first Polish food companies was granted the certificate for export to EU countries and USA. The company from Grabów is proud to hold such export licences and certificates as Hallal certificate (2003), the Ukrainian UKR - SEPTO certificate, the export licence for Japan, Canada and USA, the kosher certificate, the Russian GOST. Our further achievements include: the Eurofirm title granted by Minister of Economy and Employment, the Highest Quality Award granted by Wielkopolska Association of Research into Quality, a certificate of the 4th edition of the Consumers Competition on Produce Quality, the title of “Poland’s Best “ for the cream of asparagus soup”, “The trading hit” granted in the line of Ready Meals for “Beans Breton style” and the title of Gazelle of Busines. 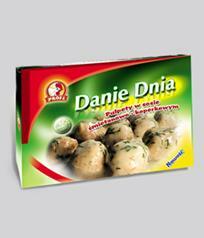 The core products offered by PROFI include poultry pates in nine flavours. They are packed in aluminium foil cans, the so-called "pickopacks" in three weights of 250 g, 131 g and 50 g so as to provide each customer with the choice. Pâtés are made of chicken except for one made of turkey. We achieved such a wide range of flavours as a result of adding specially selected spices, herbs and vegetables to the basic contents. No preservatives, taste, flavour or colour improving agents are added to the pâtés. That is why they are free of preservatives. The long „best before” period results from high-temperature thermal treatment (sterilisation) and tight aluminium foil packaging. Room temperature storage cause that the cost of warehousing our products is very low (no need for fridge). Poultry pâtés 50 g - 24-month best before period. Packed in pickopaks. Poultry pâtés 250 g - 24-month best before period. Packed in pickopacks. 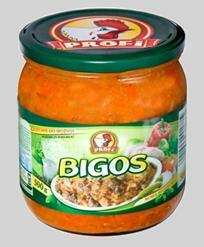 In its wide range of products PROFI has a choice of pork pates. Supreme quality pate produced with accordance to the traditional Great Poland (region of Poland called originally Wielkopolska) recipe. Product sold in 130g containers in 3 flavours: basic name –brand flavour and with additives: forest mushrooms and smoked bacon. To complement the rich trading offer PROFI presents Delikatessen Pates such as wild boar pate, deer pate, rabbit pate and pork pate. Manor pates are distributed in 100g containers. Thick-grained pâté with meat pieces, based on Old Polish recipe. No preservatives, emulsifiers or artificial flavours. Product of highest taste values satisfying taste requirements of biggest gourmets. 12-month best before period. Another line of products marketed by PROFI includes tinned pork, tinned pork –and-poultry ham luncheon meat, snacks, hams, and lard. In this group, among mince and snacks, we offer: poultry snack, pork snack, chopped English pork, pork luncheon meat. Each of these products, owing to unique selection of ingredients, is characterised by different flavour values. Among the hams we offer: turkey ham made of turkey as the name itself suggests. Pork ham mince of two weights: 110 g the smaller oval can, the so-called mandolin .They are great additives to sandwiches at breakfast or supper. Meat cans 110g,130g - 24-month best before period. Packed in pickopaks. Salmon pâté and spicy cod salad – products packed in aluminium foil pickopacks. 12-month best before period. Wild salmon pâté and Paprika pâté are excellent breakfast additives diversifying home menu. The products were presented at domestic and foreign food fairs. Salmon pâté appears in three kinds: tomato, paprika and company special with no additives. Paprika pâté, made of cod fish, is characterised by specific taste. Sterilised products, free of preservatives. 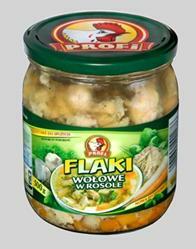 Traditional Polish dishes in new packaging, soups with meat and fresh vegetables. These products are new on the market unlike the instant soups or creams, or instant soup concentrates appearing so far on shop shelves. They are different due to modern "dypack" packaging made of a few layers of polypropylene foil, with a glass layer, which makes a barrier enabling 7-month best before period after sterilisation and a high quality product. The soups are produced based on natural chicken broth and fresh vegetables providing them with traditional home flavour. They do not contain any preservatives or artificial food dyes. Soups are instant dishes, which only need to be warmed in a microwave oven or traditionally in a pot. To prepare and serve our soup on the table you only need 5-6 minutes as compared to 2 hours’ cooking in a traditional manner. 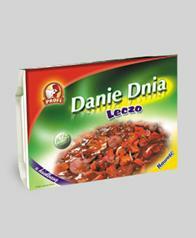 In this way we offer a healthy and attractive product in practical packaging. Meal of the Day and Ready meals in jars are based on traditional recipes while keeping the flavour and aroma of the home cousine . Is it made of choice and natural ingredients . The innovative packaging enables easy and fast preparation.